I purchased DDR UltraMix 3 the day it came out. I donâ€™t really feel like I can give this game a full review because Iâ€™ve spent most of my time playing it in the Quest Mode. The only complaint I have right now is that it takes an inordinately long time to load the game once youâ€™ve purchased all the available song packs. The same number of song packs take no time to load when Iâ€™m playing with DDR-UM2, but it takes at least a minute to load with all the song packs with the new game. I just start the song packs loading and use the time to fill up a water bottle and get a towel to wipe off my face when it gets sweaty. DDR-UM3 has the benefit of tracking your activity level in any mode that you play. The older games would require you to play in the Workout Mode in order to track your calories and time played, but now you can do that in any mode with the new game. When I saw that feature on one of the PlayStation 2 releases of DDR, I was so jealous I almost convinced Mike to buy a PS2. The reason Iâ€™ve played in Quest Mode more than any of the other modes is because Iâ€™m curious. There is a map and I can travel to a lot of places. Iâ€™ve yet to really earn enough points to â€œgain a followingâ€ in a city. I keep coming back to that mode to see if I will eventually make progress in this game. Iâ€™ve played for hours on end and Iâ€™ve only earned 4,356 points. I need 73,100 to earn a following in Seattle. I donâ€™t know if that means that Iâ€™m a really crappy dancer or if I started on the wrong city. Iâ€™m tempted to start the game again using a different controller port and see if itâ€™s any easier. In the meantime, Iâ€™ve gotten in some great workouts. On the whole DDR-UM3 has all the features that I loved about the first two DDR games released for the Xbox. There are some game features where you compete against other players that Iâ€™ve never really been able to use because I donâ€™t have any friends as obsessed with DDR that will play with me. It seems like Konami is getting better and better at making DDR an interesting game to play. I just feel a little betrayed by Xbox 360 because none of the DDR games or my dance pads will work with the new system. I guess when itâ€™s time to upgrade, weâ€™ll go with PS3. The directions for bicycle speedometers say to attach the sensor to your front tire. When you use a bicycle trainer (like the CycleOps Trainer I reviewed last week), the front tire remains stationary and the only tire that is moving is the back tire. Is it possible to attach the sensor to the back tire? Does it affect the mileage calculation? If your back tire is the same size as your front tire (most are), then you wonâ€™t have to reprogram your speedometer. If you just bought your speedometer, then youâ€™ll have to program it using the size of your back wheel. The Bell Spinfit Calorie Speedometer, which is the speedometer I have on my bike, has plenty of wire to reach the back tire. Attaching it to the back tire was actually easier for me than attaching it to the front because I didnâ€™t need to figure out what to do with all the extra cord. The biggest problem with attaching the sensor to the back tire is that the frame is further from the spokes on the back tire. The Bell Speedometer didnâ€™t have a problem with that and I was able to position the sensor so that it was close enough to the magnet on the spokes. Other brands might need some help with this matter. One way of bringing the sensor closer would be to wrap electricians tape or duct tape around the frame until the sensor was close enough to the spokes. This might interfere with removing the back tire, so if you have to do that often, take that into account. As it was, I was able to attach it quite easily using cable ties (the bright green bands pictured here). Ironically, a workout on an indoor trainer is a lot harder than one outside in the real world, so the eight and a half miles I did on my last workout felt so intense that I couldnâ€™t believe that I only went eight miles. Itâ€™s not a problem with the speedometer, however, the resistance is just so much that I get an incredible workout. It feels like Iâ€™m going uphill the entire time. The entire process of changing my speedometer from my front tire to my back tire took a total of about five minutes. The hardest part was getting past my fear of putting it on the back tire. I thought that if the sensor was meant to be put on the back tire, then they would have given alternate directions for it. As far as I can tell, as long as the sensor can reach the magnet on the spoke, there is no problem with putting it on the back tire instead of the front. The best part is that I get a measurement of my workouts in something more than time. 43 Folders: How do you get creative with your phonecam? I generally tell anyone who asks that camera phones are worthless, but this list has some ideas even I might useâ€”like taking a picture of the sign to remember where you parked, or grabbing a photo to remember a storeâ€™s hours. Be sure to skim the comments too, as the readers had lots of ideas. If the phrase “if I had a nickel for every time I had to reset the Treo” has ever crossed your mind, the Seidio Battery Cover with reset hole is a must. I’ve been using the Treo 650 for nearly a year. If I had a nickel for every time I had to reset my Treo, I’d have… a nickel. Mine crashed once the day I bought it, when I overfilled the memory with software, and I haven’t had a crash since. Nevertheless, Palm machines—not just the Treo—have a reputation of crashing more often than Microsoft Windows. Seidio isn’t insane—they actually saw a market for a special battery cover to enable quicker resets, and they’ll probably sell some. It doesn’t have to be this way. Got a crash-prone Palm? Don’t buy a new battery cover to make it easier to reset, fix it. Here are some tips to make your Palm as stable as mine. Operating systems, like PalmOS, divide a device’s memory between applications and the OS. At any given time, your Palm’s memory might be divided into sections for various portions of the core operating system, the application you’re running right now, and maybe a background application or two. Ideally, each program would use its portion of the memory, and ignore the rest. Unfortunately, sometimes a badly-written application will access memory outside its own range, which can lead to corrupted data or to a crash. Modern operating systems use a system called memory protection to prevent each application from messing with memory that belongs to the OS, or to another application. PalmOS, as you may have guessed, has very poor memory protection. Protected memory is one of the features touted for PalmOS 6.0 (Cobalt), announced over a year ago. Unfortunately, no current Palm device includes the Cobalt OS—not even the two new ones—so for now we’re stuck with the older, unprotected version. Consider whether you really need an application before installing it. Remember that any application can cause crashes, including optional software that came with your Palm. Don’t install it unless you need it. Check your list of installed software regularly and remove applications you no longer use. If possible, avoid applications that run in the background—for example, Graffiti replacements and pop-up accessories. Since these are running all of the time, they have the potential to crash your Palm any time, not just when you’re using them. Install only one application at a time, and test the Palm for a day or two before you install any others. Fortunately, there’s a great deal of stable Palm software out there that is unlikely to cause crashes—for example, Astraware’s games and Tealpoint’s applications. Once you find an application you can trust, it’s unlikely to be a problem. Install the latest updates for your Palm from Palm support. Some crashes are caused by buggy system software, so eliminate those first. Sync your Palm to a computer and view the log to make sure the sync was successful. Select App | Delete and delete everything in the list except applications you’re sure you need. Soft reset the Palm using the Reset button. Test the Palm for a few days. If it no longer crashes, you’re done. Still crashing? Try deleting all applications. (If you’re sure you have backups of the installation files for all of your software, a hard reset will do this quickly.) You should now have a Palm with only the built-in software, and no crashes. Now reinstall each application you need, one at a time. (You can usually find your deleted applications in your Palm\username\Archive directory.) After each one, try switching between applications and using every feature you can think of, and see if you run into crashes. If you make sure to install applications one at a time and use your Palm for a while before installing anything else, it’s easy to guess which application causes a crash—it’s usually the one you installed last. Also, if crashes always happen within a certain application, it’s probably due to a bug in the application. If they happen randomly in many different applications, you’re probably dealing with a background program or, rarely, a bug in PalmOS itself. After you enter the correct code and click Dial, a dialog displays the date, time, program, and error message for the most recent crash. This is especially useful since crashes will sometimes reset the Treo without displaying a message. Unfortunately, the application causing your crashes might turn out to be one you really need. In that case, your best bet is to contact the person or company who produced the application, describe the circumstances that cause the crash in as much detail as possible (including the specific error message from the Treo debugger) and see if an update is available. No update? Choose a different application, or invest in that easy-reset battery cover. I realize this is drastic advice—Palm sold you a device that can run thousands of great games and applications, and I’m telling you to install as few as possible. But with Palm’s touchy memory, that’s the only way to prevent crashes. If you’re willing to give up unstable software—and consider all software unstable until proven otherwise—you can have a crash-proof Palm. At the store, the salesmen said that I needed to change my back tire to a slick. The first salesman said that the trainer wouldnâ€™t work with a mountain bike tire. The second salesman said that it would work, it would just make a horrible noise and vibrate my house to pieces. I even had a man who had purchased a trainer who was in the store buying a tire to put on his bike to make the vibration stop. I must have really strange mountain bike tires because mine works fine. There is some vibration and a little noise, but itâ€™s quieter than the exercise bike I used to have and itâ€™s quiet enough for Mike to sleep through my workout this morning. Attaching the bike to it was pretty easy, especially since I didnâ€™t need to change my back tire. I didnâ€™t change the quick release lever because the one on my bike was the same style. All I had to do was adjust it a little and attach my bike. I was able to ride it within 30 minutes of opening the box. Working out with the trainer is actually harder than riding my bike around town. I rode my bike to work every day for months and the only time it was really difficult was when I had to ride up the huge hill that goes over I-15 and the train tracks. Now, with the tension settings on the trainer and my gears, I can make it hard enough that I can barely move the pedals. Hopefully, Iâ€™ll work up to that level, but for now, I can keep my heart rate above 70% of Max with the gears at a much lower level. Even the lowest gear possible is high enough to almost put me in the 60% of Max zone. Iâ€™m so glad I have a heart rate monitor. I would be tempted to push myself a little too hard with this gadget. The front of the bike would be kind of loose and tilty if I didnâ€™t get a riser. I got the Kinetic Riser Block. It has four heights, so youâ€™re pretty likely to find one that feels good and works with your trainer. This one seemed a lot more stable than the CycleOps Riser Block. On the whole, Iâ€™ve been very pleased with the CycleOps Bike Trainer. Being able to workout in my home on my own bike is so much better than going to the gym and trying to get comfortable on the one-size-fits-all exercise bikes. When these were released over the last few years, I sincerely thought they were going to revolutionize the gaming and exercise world. Itâ€™s impossible to actually purchase an exercise bike that connects to your Xbox or PlayStation, but these things will be available until they are gone or broken. I have my doubts about how active they can actually be, especially the virtual reality games that require the child to wear a visor like the one pictured. That game just looks like a recipe for injury. I am eager, however. to see the second generation of exertainment. Considering the power of the Xbox 360 and the awaited PlayStation 3, there should be a multitude of options out there for companies that really want to break into that field. At first, I was shocked when I saw young kids with cell phones, but I see it more and more every day. I actually understand why parents would allow their children to have cell phones. It makes them more accessible and are handy in an emergency. I remember many a cold day searching for a pay phone so I could call my mom. A cell phone would have come in handy back then. This article tries to address the factors that should be weighed when deciding whether a child is worthy of getting a gadget. Iâ€™m always wary when the mysterious â€œExpertsâ€ say anything, but I think itâ€™s sound advice. More importantly, I would have liked to see more advice on knowing when a child is ready for such a device. One indicator is whether they are willing to put their money where their mouth is. My mom was always willing to get us the gadgets we wanted, but I think she had a test for us. She would tell me that if I wanted something, I would have to save up my allowance for it. By the time I got about fifty percent of the money, she would be willing to chip in the other fifty percent. Sometimes, on particularly big purchases, she would tell me up front that if I could save half the money, she would pay the other half. That always worked. When I was saving up those dollars to buy the Barbie Star Traveler, I had to weigh every penny to see if it was worth it. I think if parents did the same thing as my mom did, they would KNOW that their child really wanted the gadget and was worthy of it. I expect quite a bit from a digital watch. Iâ€™m a regular user of features like countdown timer and stopwatch, and when I find a full-featured watch that actually looks good, I jump at the chance to buy it. Nikeâ€™s Oregon Digital has all of the features I need and a good design, and aside from a couple of minor inconveniences itâ€™s a great watch. Read on for the full review. 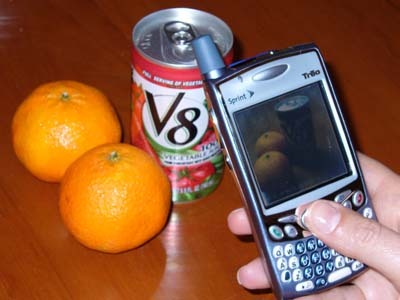 Here is a unique use for your camera phone that might actually help you lose weight. Every day, you take pictures of every meal and snack and upload them to your account. Once a week, you will receive a video message from their nutritionist with recommendations on how to eat healthier. You can keep track of your meals in visual form online along with your weight, BMI, waist to hip ratio and lots of other items that you may want to track. They charge between $99 and $149 a month for this service, which is near the cost of hiring a nutritionist once a month to look over your food logs. Itâ€™s a really good idea, but itâ€™s something that you could do on your own just as easily. You could use your camera phone as your food journal and use it to calculate your calorie intake every day. By doing a little of the homework yourself, you could save the $149 a month. Both reviews are worth a read if youâ€™re looking for a new PDA and arenâ€™t interested in a smartphone. Quick summary: The Z22 is a nice entry-level handheld for $99 and its iPod-like design sensibility doesnâ€™t hurt. The TX, while adding WiFi support to the feature list of the previous top-of-the-line T5, has less memory and a slower processor, so itâ€™s perhaps not the ideal upgrade. Between the strange LifeDrive and this lackluster entry in the high-end PDA market, I think Palm has truly lost touch with the market for non-smartphone PDAs. Iâ€™m not sure if that market will still exist in a few years, but if it does, Iâ€™m afraid Palm will still be way behind the times.